An extremely resourceful algae-based, vegetative stimulator for root development, Canna Rhizotonic is 100% natural. As it contains a great multitude of vitamins, Canna Rhizotonic will provide over 60 microbiological nutrients to speed up the growth process and keep your plants roots happy and healthy. Rhizotonic is especially beneficial when transferring or shipping plants as it has an extremely calming effect. It will aid those plants that are not developing properly or have health issues. It is also beneficial in increasing pH levels. Both private and professional growers alike can attest that plants have recovered from stressful events once they have been treated with Rhizotonic. This includes re-potting, transporting and shipping. It has been known to greatly repaired those plants that have development or other health issues. When diluted properly, you can use Rhizotonic to soak your seeds to help soften the skin which will help during germination. Rhizotonic will stimulate new growth on both transplants and new cuttings. With the help of Vitamins B1 & B2, as well as the other trace elements found in this additive, it will stimulate hormone production to boost root growth, especially during the first few weeks of growth, when plants are most susceptible to disease. 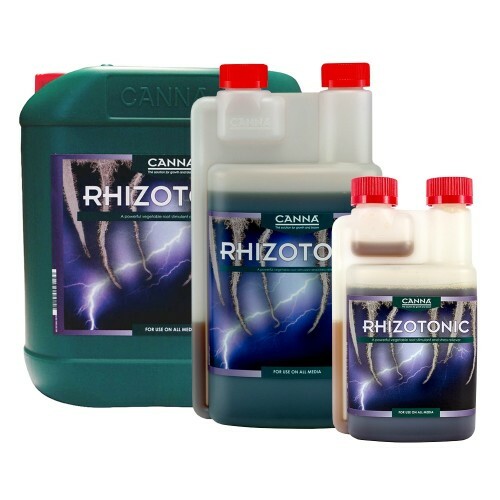 Canna Rhizotonic is suitable for all substrates including hydroponics, soil and Coco. It can also be used as a foliar spray when diluted properly. Follow the directions specified per your harvest/medium. Never mix with other additives in the concentrated form (unless other specified) and never mix directly into the medium. Wait a few minutes between applications. and rockwool are inert, it is extremely beneficial to use this revolutionary product for proper nut..